I can't believe that it has been six months and am keeping up with Year of the Cupcake. It's amazing! 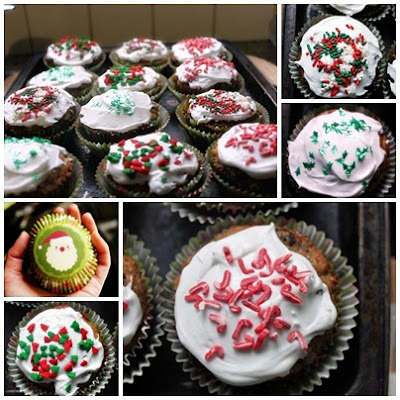 I decided, being Christmas, that I would make my cupcakes Christmas-themed. I was going to go all out and invent a subtle blend of Christmassy flavours, and then I thought "screw it" and hit Google up for a recipe. I also have a new love - Bakingpleasures.com.au. I must preface this by saying that at this stage they have no idea who I am, besides a customer who buys really cute cupcake wrappers and sprinkles from them. I dare say they have some kind of stat counter widget on their site that also shows them that I spends hours lurking on their site, perusing their stock and dreaming of what cake decorating adventure to next embark upon. I know that's sad. You don't need to tell me! Maybe one day I'll send them some pictures of their products being used, because if **I** ran a baking supplies shop then chances are I'd be interested enough in baking to see what people were doing with my goods. Also, I know that plenty of people don't like Christmas cake, but I don't care. **I** do, and I have to enjoy these cupcakes, too, even if I have to eat the whole danged lot of them! 1 tsp finely grated orange rind <-- I bought an orange, forgot I had it and used some old candied peel still lurking in the fridge from five Christmases ago. It was fine! Preheat oven to 170°C. Line twelve 80ml (1/3-cup) capacity muffin pans with cases. Use an electric beater to beat the butter, sugar and orange rind in a bowl until pale and creamy. Add the eggs, 1 at a time, beating well after each addition. Stir in the dried fruit, walnuts and orange juice. (NOTE - I combined the fruit and OJ an hour or so earlier to allow it to soak into the fruit and make it plump. I don't know whether that is the intention or whether the OJ is there to moisten the cake and not the fruit, but it seemed to turn out fine. The fruit was plump and juicy, anyhow!) Stir in the combined flour and mixed spice. Spoon into the lined pans and smooth the surfaces. Bake for 30 minutes or until cupcakes are firm to touch. Set aside in the pans for 5 minutes to cool before transferring to a wire rack to cool completely. Now, when I make royal icing, I never quite seem to use the entire cup of icing sugar as it gets quite stiff quite quickly. Giggle. I don't know what I'm doing wrong and I'm not sure if I care, but I figure you're better off with rock-solid, stiff icing than runny, gloopy icing! Spread on cooled cupcakes and decorate with various sprinkes and sanding sugars while the icing is still sticky. C'mon guys, seriously, how cute are those sprinkles, and those cupcake wrappers?? The shiny Christmas trees really are edible, and the minature candy canes are actully peppermint flavoured! How awesome is that! Next year I'm thinking about making snowflake-shaped biscuits with stencilled snowflakes. Even though snow has nothing to do with Christmas, especially in Australia. But they'd be so pretty.